One of the most exciting ways to get an ant farm underway is to start with a colony at the very beginning of the ant colony life cycle, when the colony contains just one kind of ant, the queen. New colonies get their start when winged queen and male ants fly out of mature colonies and mate. The image on the left, taken by Alex Wild, shows queens in flight. But how do these winged ants know when to fly out of the nest to find a new mate? Depending on where they are found, they can rely on different kinds of information, including the day length, temperature, and rainfall. So the biggest trick is usually to have a good idea of when-what time of year and what time of the day-to look for them. 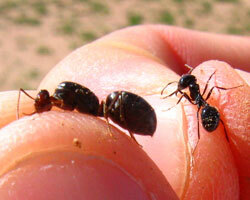 Also keep in mind that you’re most likely to find them in an area that already has a lot of ant colonies present. 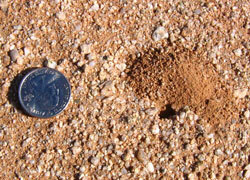 In places like Arizona, some ants will start new nests in the springtime, sometime between March and May, depending on the ant species and the temperature. 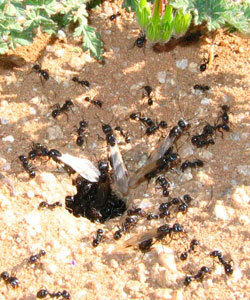 Other ants will wait until the summer monsoon rains have rained enough to drench the soil and make it easier to dig a new nest. So getting the timing just right to find queens that are starting new nests can be kind of like winning the lottery-you have to be patient and persistent and willing to wait until conditions are just right. A good way to know if your chances of finding a queen are good is to go over and take a look at what’s going on in some big, mature colonies. Before the queens and males leave the nest to mate, they will usually hang out around the entrance of their parent colony for a little while, deciding if the weather is just right for some flying. 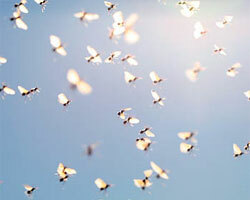 If you see winged queens and males in a colony about to take off from the nest, you will probably start to see mated and now wingless queens running around sometime shortly after that. Queens that have just mated and are looking for a place to start a new nest resemble tourists that are lost in a big city, running around, taking wrong turns, getting into arguments, and poking their heads into cracks in the ground as they look for just the right spot to dig their new home. Some newly mated queens will still have their wings attached, but most will tear them off pretty quickly as they start to look around because wings make the queens an easy target for predators to find. In contrast to the queens, worker ants look more like people on their way to work and school, traveling along straight trails in a purposeful fashion as they go about their regular business of collecting food for their colonies. While a queen is busy looking around, it’s pretty easy to reach down and pick her up gently between your fingers, being careful to hold her firmly but not crush her. With a little bit of practice, you can even get good at just grasping her by the legs. If you are lucky enough to spot more than one queen, pick up as many as you can collect, because not every queen will be able to get a new nest started. 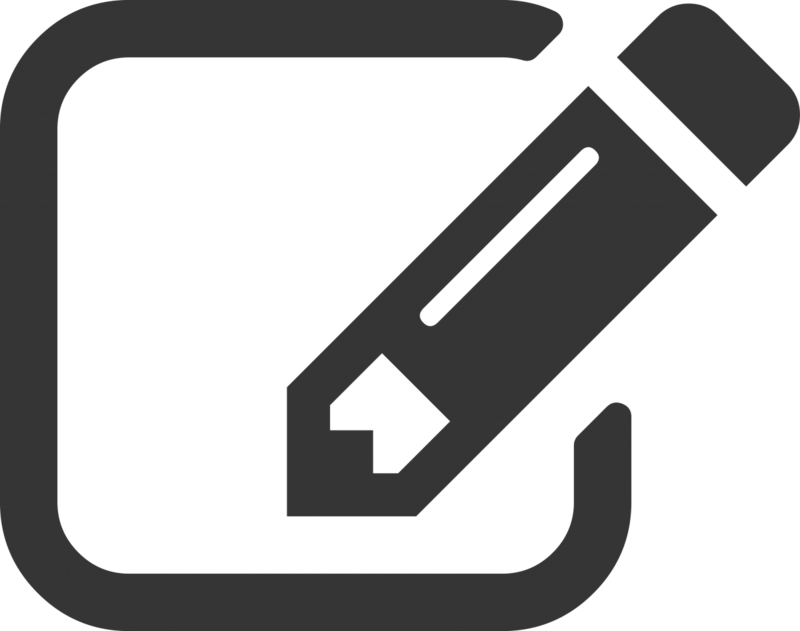 Queens can be kept in a small container such as a film canister for a little while. Just make sure they have plenty of water, which you can provide by giving them a soaked cotton ball. They will be hard to watch, though, so you could also build an ant farm to be able to see what’s going on. Just be sure to collect up several cups of the soil from the place where you collected the queens. If you’re just a little bit too late to collect queens while they’re still running around, it is still possible to collect them as they start to dig a new nest because they won’t be very deep underground. Start out by looking around for a small hole in the ground that is surrounded by a little heap of fresh dirt. 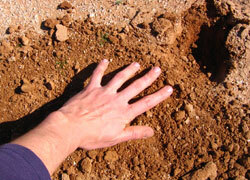 Use a hand shovel to dig up the dirt around the hole, and use your hand to fan it out across the surface of the ground. 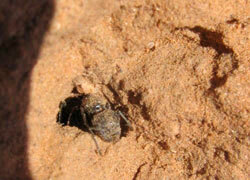 If the hole contained a queen, she will usually try to scramble free of the dirt to escape. Not every hole will contain a queen, so keep trying if you don’t succeed at first. Besides, you might find some other cool surprises as you dig! Just be careful to fill in the holes that you have dug when you are finished.